Some of the interesting border security political maneuvering that's playing out after the president's State of the Union address on Tuesday regards use of the National Guard. When talking about immigration and border security, the president made clear his resolve to have a border barrier constructed where the "experts" — presumably the Border Patrol — think it is necessary and appropriate. He also said that he would be sending another 3,750 military personnel to the border to shore up resources. The Defense Department has since indicated that some of its resources will be shifted toward Texas in anticipation of the most recent caravan that has found its way to the border of that state, although news reports say that yet another caravan is following the extreme westward route, and will position itself south of San Diego in an attempt to enter. This leaves one wondering whether we are going to constantly have to see-saw military resources back and forth as caravans repeatedly flow northward from Central America — which we have to assume are going to continue until there's effective action to halt them in their tracks. As part of the political chess game going on, hours before the president spoke, the Democratic governor of New Mexico, Michelle Lujan Grisham, ordered a pullback of the troops under her control with the single exception of Hidalgo County, which has been hard hit by illegal entrant crossings. One wonders whether she had an embargoed advance copy of his speech and was calling the president's bluff with her order. Of course, there's irony in her partial pullback. If there's no emergency, as Democrats continue to assert, then why is the governor leaving them in what is, by her own admission, the hardest-hit area of her state? As for the president's move, it's well to put it into context. As things stand, the National Guard members assigned to the border do a variety of support tasks. The theory is that this frees more Border Patrol agents to do actual patrol and apprehension work rather than administrative duties, however necessary they may be. 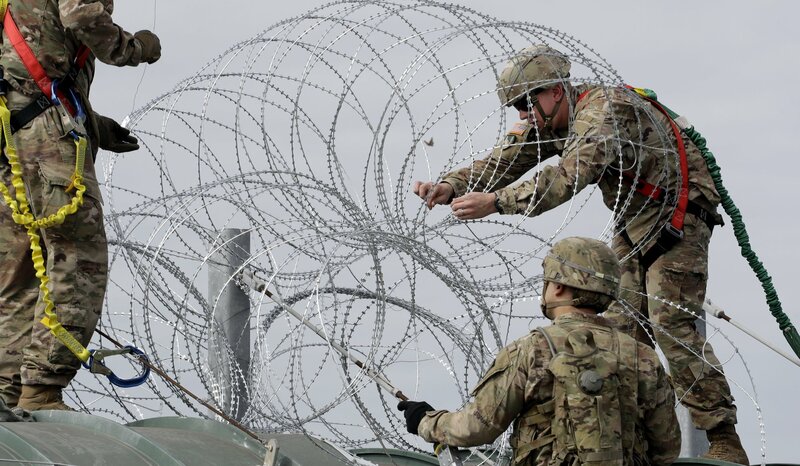 Some of the military's assignments, such as stationing new impediments like concertina wire or establishing new monitoring posts, are undoubtedly of utility. But let's be honest in acknowledging that such wire can be cut and removed pretty quickly by smugglers and that additional monitoring of illicit crossings is perhaps useful as an intelligence exercise, but little else if, even with the newly freed agents, there aren't enough to actually respond to all of the trespasses. But here's the crux of the matter: What happens with those agents newly freed from administrative duties? Like their compatriots already patrolling the line, as often as not these days they spend huge amounts of time actually being met by minors and partial family units who walk up to turn themselves in because they know that, as things stand, the U.S. government has tied itself up in knots between bewildering court decisions, lack of detention space, controversies over separation of families, and immigration hearing backlogs that have reached a million cases. The adults with children in tow are counting on being released in very short order, and they're not wrong. Border Patrol agents spend huge amounts of time "processing" such aliens — and acting as pseudo guardians for the minors for a short period of time — until they can be moved along to the Office of Refugee Resettlement or one of its contractors for placement at one of many sites established throughout the nation. In other words, these agents merely act as cogs in the wheel resettling these aliens who, though they have crossed brazenly and illegally into the United States, will be permitted to remain and work for years. This should prompt us to ask, then: Does adding more National Guard troops to the border do anything meaningful at all, absent a physical barrier to prevent the entries in the first place, and equally importantly, amendment of the laws and regulations that have so egregiously permitted abuse of the nation's asylum system? Any reasonable observer might conclude that it only seems to hasten the pass-through of aliens within our quickly crumbling immigration-control infrastructure, with no real-world consequence for violating our borders and our laws.